Billionaire sweatshop sponger Bruce Rockowitz's CEO in October 2011 Rockowitz married Hong Kong pop star Coco Lee in a ceremony that reportedly cost $20 million. The company he manages had a combined net worth of $6.2 billion in 2012. September 19, 2013 -- Climate & Capitalism -- Consumers are ultimately the ones responsible for dangerous conditions in garment assembly plants in the global South, Hong Kong-based business executive Bruce Rockowitz told the New York Times recently. The problem is that improved safety would raise the price of clothing, according to Rockowitz, who heads Li & Fung Limited, a sourcing company that hooks up retailers like Macy’s and Kohl’s with suppliers in low-wage countries like Bangladesh. ”So far”, he said, “consumers have just not been willing to accept higher costs”. May 9, 2011 -- Asia Left Observer, posted at Links International Journal of Socialist Renewal with permission -- Located in the largest delta at the world, where two Himalayan rivers, the Brahmaputra and the Ganges, converge and flow into the Bay of Bengal, Bangladesh is used to climatic catastrophes. Half of the land area of Bangladesh is less than 10 metres above sea level. It consists mainly of silt deposited by the rivers that flow down from the Himalayan glaciers. When the snow melts it regularly causes large-scale floods. The coast is at the mercy of cyclones and giant waves which submerge the coastal areas. 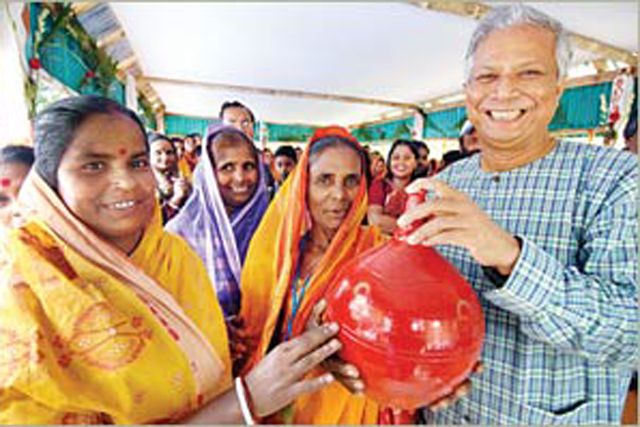 Grameen Bank's Muhammad Yunus (right) with Bangladeshi women. The promised empowerment and poverty reduction failed to eventuate. April 27, 2011 -- Links International Journal of Socialist Renewal -- Bangladesh’s once-legendary banking environment is now fatally polluted. The rot is spreading so fast and far that the entire global microfinance industry is threatened. Controversy ranges far beyond poisonous local politics, the factor most often cited by those despondent about Grameen Bank’s worsening crisis. 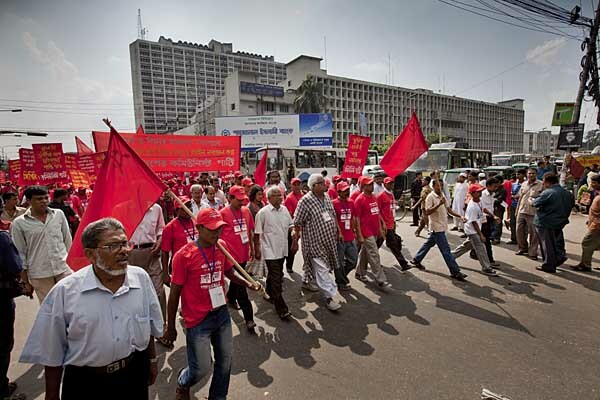 The National Committee to Protect Oil, Gas, Mineral Resources Power and Ports organised a "Long March" in October 2010 to oppose the plunder of Bangladesh's natural resources. More photos at http://www.shahidulnews.com/2010/10/long-march/. December 28, 2010 -- Anu Muhammad is an eminent Marxist and a renowned academician from Bangladesh. He is currently serving as professor in the Department of Economics in Jahangirnagar University, Savar, Dhaka. He is also general secretary of National Committee to Protect Oil, Gas, Mineral Resources Power and Ports and has been involved in various people's movements in Bangladesh. He, along with the committee, played an instrumental role in the success of the Phulbari Movement against Open Pit Mining in Phulbari, Bangladesh. He writes extensively on globalisation, social transformation, gender issues, NGOs and energy issues, and has authored more than 20 books. March 8, 2010 -- Despite the fanfare about Asia’s "miracle" economies, the problem of "missing women and girls" is actually growing, according to the United Nations Development Program-sponsored 2010 Asia-Pacific Human Development Report. These "missing" girls and women are a result of the abortion of girl fetuses and women dying through sheer neglect – underfed and starved and not receiving adequate health care. The birth gender disparity is the highest in East Asia, home of the Asian "miracle" economies, where 119 boys are born for every 100 girls. China and India, much touted for their economic success, account for 85 million of these 100 million "missing" women.